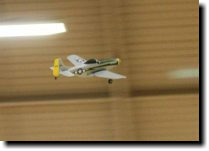 I gather indoor R/C airplane flying is fairly common in some areas of the country. But here in the Bay Area, there's been a lot of demand and not many opportunities to do it, so there was great excitement at a recent opportunity to rent Sunnyvale's community center gym for some Sunnyvale Indoor Flying. Indoor flying has come a long way. I remember a couple of years ago when most of the indoor planes were either "3-D" planes like my skunk plane that can stay in a small area by hovering, or weirdo concoctions like the Mini IFO. There were a few pioneers who used microminiature actuators and other fancy hardware to build tiny lightweight custom planes, but that was an expensive and difficult proposition. But lithium-polymer battery technology and advances in tiny servos and brushless motors have created a revolution in super lightweight micro flyers, led by the Parkzone Vapor (Dave's is pictured at right). 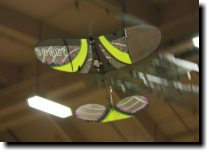 At a flying weight of half an ounce, the Vapor makes it easy for anybody to fly in a small gym or even a large room. For folks who want something a little faster and more aerobatic, the Mustang is a bit heavier at 1.2 oz, but still flies well in a gym. And of course, there are the hundreds of micro-helicopters that are popping up everywhere over the last year or two. Pretty cool stuff! Anyway, we had a great session on Friday flying these planes, and amazingly avoided any serious carnage (unusual for indoor flying where there are so many walls and basketball hoops to smack into). I'm a little out of practice and found the flying a bit intense, so I took a few breaks between flying sessions to shoot photos. For the new year this is going to turn into an AMA-chartered club, BAM (Bay Area Microflyers). Watch the BayRC forums for more details.